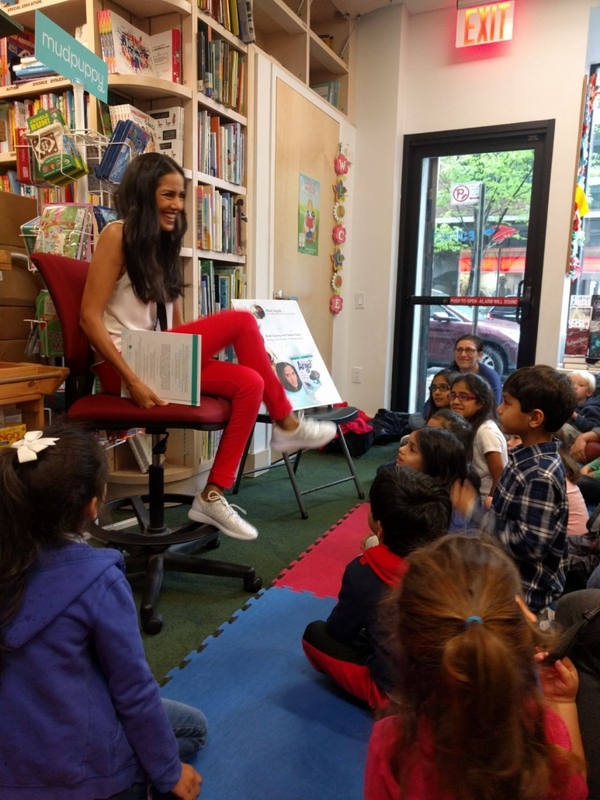 Sheetal Sheth is an actress, activist, and now an author. The daughter of immigrants from India, Sheth has been a trailblazer, helping to lead the way for increased representation of South Asians on screen and in media. Beside her work on screen, Sheth has a long record of involvement in educational efforts, including participation in AmeriCorps and work with Big Brothers, Big Sisters in Los Angeles. She is also on the board of Equality Now, an organization that uses the law to promote equality for women and girls around the world and is an ambassador for The Representation Project, an organization that “inspires individuals and communities to challenge and overcome limiting stereotypes so that everyone – regardless of gender, race, class, age, religion, sexual orientation, ability, or circumstance – can fulfill their human potential.” We had the privilege of meeting earlier this month when Sheetal was in Boston for a reading of her extraordinary children’s book Always Anjali. Adam S. Sheetal, I’ve been thinking about why your book has resonated with me so strongly. I think part of it is that I felt a lot like Anjali as a kid. I grew up as one of the very few Jewish kids at my elementary school and there were times I just wanted to disappear. It seemed everyone but me was Irish American and I just wished I could change my name from Adam to Sean. Was that your experience? What was it like to be the daughter of immigrants when you were in school? Sheetal: I so appreciate you sharing that story. One of my favorite parts of putting this book into the world has been hearing stories from so many different people and with such varying perspectives and experiences. It’s a book that anyone can relate to regardless of your background or gender. I grew up keenly aware that I was lucky to have been born in the United States. We went back to India often and I truly appreciate the sacrifices my parents made to give us this life. But when you’re a kid and being made fun of or you’re feeling left out for any number of reasons, you question everything and it all feels monumental. However, I had some really great friends and you get through it. You carry on. Adam: I hear that. Having a few good friends can make a big difference. What do you know about your parents’ decision to migrate to the U.S.? Why do you think your parents let India? Adam: My great-grandparents, on both sides, came to the U.S. in the late 19th and early 20th century. I’ve often wondered about their transition here. What do you know about your parent’s acculturation here? What do you think made it difficult? What do you think made it easier? Sheetal: As much as they wanted a ‘different’ life, it was hard. And particularly hard for my mom who had never been to this country and had to figure out how to make a life here. This was in the early 70s when there weren’t that many South Asian immigrants, there weren’t Indian grocery stores, or much of any of the luxuries we have now. They were looked at as outsiders with accents and living paycheck to paycheck. But they forged friendships and were instrumental in building community wherever they lived. They were one of the founding families of a local Temple which is special in that there are four faiths represented under one roof. They were promoting inclusivity and unity even back then. I know they love their life now and wouldn’t change it but they worked their butts off for the life they have and earned every bit of it. Adam: You must be tired of this question, but what made you decide to write Always Anjali? What do you want readers, in this case, parents, teachers, and children, to take away? Sheetal: Telling stories is what I love to do, I’ve just been doing it through a different medium. But in this case, my purpose crossed disciplines organically. When I was pregnant with my first child, I was dismayed at the lack of representation in kids literature. I didn’t see enough children’s books that featured kids of color just living their lives. Most books I found were centered around a cultural holiday or event. We are never going to feel like we are part of the fabric of the mainstream unless we are the heroes of stories where we are doing everyday things. The narrative itself draws from my experiences, my friends’ experiences, my adult experiences, the conversations of the day, and the lack of inclusion across all media that seems to tell our kids that their experiences aren’t worthy. I also think we can take more chances with our children’s literature. Kids want to talk about everything. And it’s more important than ever if we have a shot at changing the systemic ‘-isms’.” Obviously, the manner in which we discuss and the language has to be appropriate, but I truly think the world is in such disarray is because we aren’t equipped to communicate well. It seems productive, open conversations are increasingly rare. Also, kids say mean things. And sometimes don’t even know they are doing it. Teaching our kids empathy is one of the most important things we can do for them. And then to talk about what to do in these situations. “What do you do if it’s happening to you? And what can you do if it’s happening to someone else? How can we not be a bystander, but an “upstander?” Talk about the images in the book. “What do you think Anjali is feeling right now? Why? Why didn’t the booth have a plate with Anjali’s name on it? Is it ok to be different? What’s unique about you? If being different is ok, why did Zachary tease Anjali?” So many questions that can allow for really meaningful conversation. Thanks, Sheetal. I appreciate you taking the time for this. For more with Sheetal, listen to this WYNC interview and check out this piece on Always Anjali from the Today Show parenting team. We would love to hear how educators and parents are responding to the book. Here is a link to an educator’s guide for the book. If you’ve read it with young people, let us know. How did they respond?